It was celebration time in London last year when Rory was commended for his skill at colour, receiving the prestigious L'Oreal Colour Specialist Degree at the L'Oreal Technical Centre after a gruelling 18 day course. Students were given in-depth colour training, ending with a final degree examination. They now have the confidence to apply colour successfully in the salon. Said Rory: "This was one of the most challenging and rewarding courses I have ever undertaken. It has given me great confidence to tackle any situation in the salon." In today's hairdressing, the colour market is so huge that enormous potential remains to be tapped. Rory explains: "Everybody wants to try it out, but it's not easy to get it right. So many people want to have a go themselves. But it is one of the hardest things to do in hairdressing. You need to get it absolutely spot on. Hence the need for courses such as this." And Rory should know this, having sptarted in the business at just 22. This came about after he saw an advert in a local newspaper. After school, he wasn't quite sure what he wanted to do, but had been cutting everybody's hair at home and when he saw details of training courses in hairdressing he thought he would give it a try. Some of his clients have been with him since day one and this personal link is the key to his success. So it's no elaborate studios in Manchester or London for Rory, but stronger local connections that he is keen to develop. 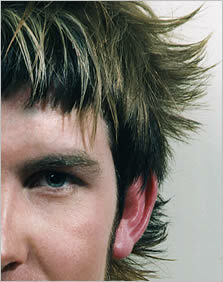 Rory said: "The key to running a successful salon is establishing that person to person contact. The hairdresser cannot afford to become complacent. You must seek to improve your technique all the time. We do training every week, constantly updating and refreshing. It's hard work, but the best way to stay ahead of teh competition." All stylist have their wish list of people's hair they would most like to work on, Rory is no exception. His dream would be to style for superstar Julia Roberts and Pop Idol Will Young. me great confidence to tackle any situation in the salon." one of the hardest things to do in hairdressing. You need to get it absolutely spot on. Hence the need for courses such as this." school, he wasn't quite sure what he wanted to do, but had been cutting everybody's hair at home and when he saw details of training courses in hairdressing he thought he would give it a try. complacent. You must seek to improve your technique all the time.